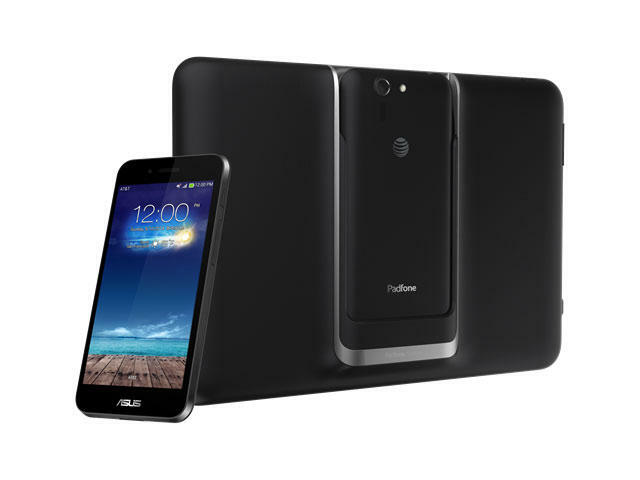 Way back in January during the 2014 Consumer Electronics Show, AT&T announced that it had plans to sell the Asus PadFone X sometime this year, but stopped short of providing us with the full specs. Earlier this month, the carrier again teased that the smartphone/tablet hybrid was coming, but didn't tell us anything more. Now, AT&T is finally providing us with detailed specs. The PadFone X smartphone will offer a 5-inch 1920 x 1080p display and will plug into the PadFone Station, which itself has a 9-inch 1920 x 1200 display. The phone, which powers the experience on the station, runs Android 4.4 KitKat and is equipped with a 13-megapixel camera, a 2-megapixel front-facing camera, a 2.3GHz quad-core Snapdragon 800 processor, 16GB of storage with support for up to a 64GB microSD card, 2GB of RAM and a 2,300mAh battery. The PadFone station, which can also help charge the phone, has a much larger 4,990mAh battery and its own 1-megapixel front-facing camera. AT&T stopped short, yet again, of providing a price or release date details. Considering it's continuing to build hype, and at a quicker pace, we expect to see the device launch in the near future. For now, at least we can expect a powerful device – though without the latest Snapdragon 801 processor that powers the new Galaxy S5 and HTC One (M8).